One of the oddest pairings in a Windows Phone game has to be found in the game Chickens and Moles. It's a first person styled "Angry Birds" type game where you are tasked with rescuing chickens and moles from Farmer Grumble's cages. Instead of tossing birds to destroy pigs, you toss boulders (or is it cannon balls?) to free the chickens and moles. Chickens and Moles has sixty levels where you toss your boulders at the structures protecting the animals in cages. The concept is as the structure crumbles it breaks the cages and the chickens and moles run free. I wouldn't consider Chickens and Moles a "must have" game but it's not too shabby of a Windows Phone game when you're in the mood for something different. When you launch Chickens and Moles you get to view a movie on how the chickens and moles cause a disturbance on the farm. As a result, Farmer Grumble cages them. If you're not a movie fan, you can skip the cinematics and jump to the main menu. The main menu has options to view your achievements, treasures, settings, and the about screen. You also have links to the developer's Facebook and Twitter pages as well as an option to play the game. Each of the 60 levels can be replayed and the game screen has the caged animals protected by a variety of structures. You are armed with a set number of boulders (indicated in the upper left corner) and to launch a boulder at the structure, just tap the screen. Shots need to be strategic to create a chain reaction that will bust the cages open as the structure collapses. You'll need to free all the animals to advance to the next level and along the way you have twelve treasures to collect to add to the game's challenge. Graphics are nice, game play somewhat challenging but there isn't a real hook to keep you coming back for more. Chickens and Moles is a fun game to play but is more suited for when you need a change of pace. The biggest downside to Chickens and Moles is that there isn't a trial version. The full version won't break the bank at $.99 but it would be nice to see the first few levels available in a trial version. 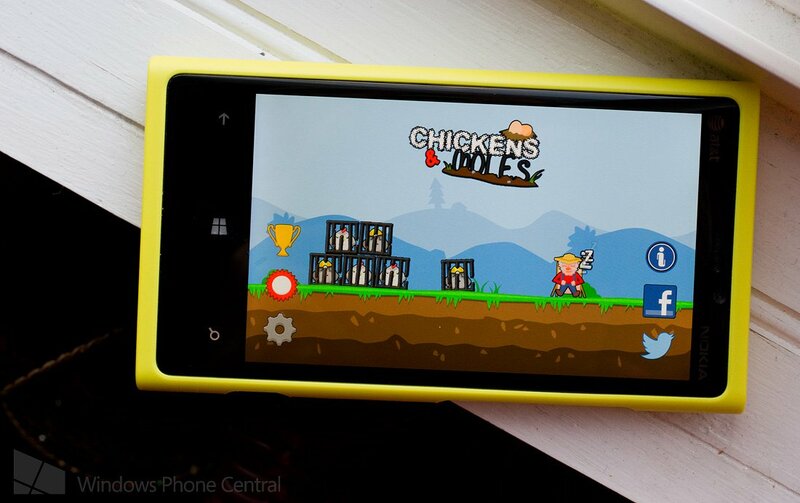 You can find Chickens and Moles here in the Windows Phone Store.